World’s first 3-D virtual reality system for neurosurgery, developed at The Ottawa Hospital, will be used to increase the accuracy of deep brain stimulation surgery for patients with Parkinson’s. A bystander only sees neurosurgeon Dr. Adam Sachs wearing large goggles, looking at the air between the two wands he moves back and forth in front of him. What Dr. Sachs sees is a three-dimensional image of a patient’s brain, with its electrical activity superimposed. This isn’t a video game. It’s the cutting-edge of deep brain stimulation and neurosurgery technology. Wearing virtual reality goggles, Dr. Sachs can view an accurate, computer-generated 3-D image of a patient’s brain with Parkinson’s disease, created using the patient’s own MRIs. The patients’ brain activity recorded from microelectrodes can be visualized in this virtual world. With the two wands, or joysticks, he can move the three-dimensional brain around, seeing it from all angles. He can also remove layers of the brain to look inside at the exact spot where he will place a DBS electrode during deep brain stimulation (DBS) surgery. He is hoping to soon use this technology in the operating room. Neurosurgeon Dr. Adam Sachs is planning to use 3D virtual reality in his deep brain surgery for patients with Parkinson’s. This medical 3-D virtual reality system was developed at The Ottawa Hospital, and is expected to be the first of its kind in the world to be used for deep brain stimulation surgery. Drs. Justin Sutherland and Daniel La Russa are clinical medical physicists in the hospital’s radiation oncology department. The two used their imaging expertise to develop a virtual reality system that combines a patient’s MRIs and CT scans to create a 3-D image of a patient’s organ or body part to give surgeons a detailed, accurate representation of the surgical area. Historically, medical virtual reality programs were used by patients mainly for rehabilitation. Patients would wear VR-goggles to help relearn how to move through and cope with different environments. Until recently, the technology wasn’t good enough to create images of organs or tissue that could be used by clinicians in a manner that improves on current practice. One Ottawa Hospital surgeon interested in using 3-D virtual reality was Dr. Sachs, who performs deep brain stimulation surgery for people with Parkinson’s. During this procedure, a microelectrode, no wider than a human hair, is implanted into a very specific area of the brain. The microelectrode then records activity from and stimulates that part of the brain and alleviates some of the patient’s symptoms, such as tremors and akinesia or the loss of ability to move their muscles voluntarily. The virtual reality system allows the electrical activity, stimulation effects and the MRI to be visualized together. “In deep brain stimulation surgery, because the target is very small and in the middle of the brain this leaves the surgeon with the problem of how to visualize the person’s brain to understand the area and where to put the electrode,” said Dr. Sachs. Neurosurgeon Dr. Adam Sachs uses virtual reality wands to manipulate a 3D image of the brain. He said neurosurgeons use MRIs and brain atlases to get a mental image of what the patient’s brain looks like. The problem is these atlases are maps created from many different people’s brains, but each patient’s brain is unique. As well, the brain atlases are only two-dimensional, while the brain is three-dimensional. This makes it difficult to place the microelectrode in the exact spot in the patient’s brain where it will have the best chance of halting or reducing the Parkinson’s tremors. 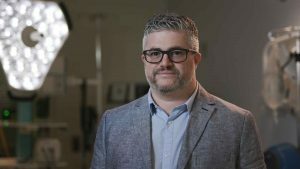 Dr. Chadwick Boulay, a senior research associate in the neuroscience program, understands the challenges faced by neurosurgeons when implanting an electrode at the optimal position in the brain. When Dr. Boulay learned about the 3-D virtual reality technology being developed at The Ottawa Hospital, he realized the potential this had for increasing the accuracy of deep brain stimulation surgery. He and Dr. Sachs worked with Drs. Sutherland and La Russa to develop a virtual reality program that would enable them to see the patient’s brain in three dimensions. “This is really exciting,” said Dr. Sachs. “The deep brain stimulation electrodes will be more precisely placed because we’ll be able to integrate accurate images from the patient’s anatomy and visualize it in three dimensions,” said Dr. Sachs. He anticipates that the resulting precision of the placement of the electrode will improve outcomes for patients with Parkinson’s disease, but this will be confirmed through research. About 15 people undergo deep brain stimulation surgery at The Ottawa Hospital every year. Drs. 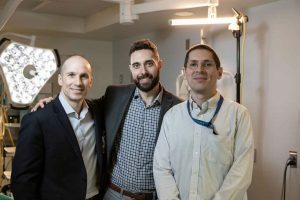 Daniel LaRussa, Justin Sutherland, and Chadwick Boulay have teamed up to design a 3D virtual reality program for Dr. Adam Sachs’ deep brain stimulation surgery. Dr. Sutherland foresees that this 3-D virtual reality technology will one day be in every department throughout the hospital. He says the overall system is surprisingly inexpensive, as the computer that runs it and the goggles only cost a few thousand dollars. The possibilities for this technology are endless. He said it has huge potential for education—teaching medical anatomy—and for surgical planning. Dr. Sutherland sees Dr. Sachs’ endorsement of this system as a shining example of how doctors can use this technology to improve what they do. “Nowhere else in the world are they using virtual reality in this fashion,” said Dr. Sachs. 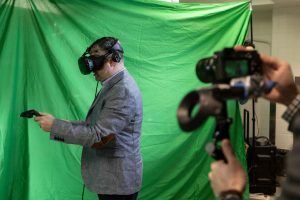 The Ottawa Hospital is quickly being positioned as leaders in 3-D virtual reality technology and has already gained international attention. Drs. Sutherland and La Russa have given demonstrations and been invited to talk at large medical conferences, and other institutions have contacted them with interest in using this technology. Help us invest in state-of-the-art technology. Innovation at The Ottawa Hospital is creating change now for better health tomorrow. Radiosurgery treatment for tumours in brain and other organs revolutionized outcomes for patients. The Ottawa Hospital’s CyberKnife is only one of three in Canada. Platinum seeds help CyberKnife robot more successfully detect and destroy inoperable tumours, improving outcomes for patients. With the help of a 3D-printed model of Maureen’s uterus, Dr. Sony Singh removed all 50 tumours and left her uterus intact, allowing her to carry a baby if she decides to.